An incredibly short introduction. Pilar is actually back after the conversation, to add some comments. 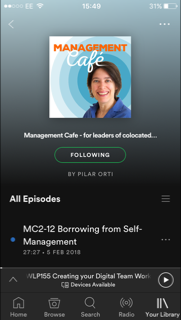 Remember to check out these other two podcasts: Management Café and Evidence Talks. 03:45mins Curtis's journey working in organisations. Impartiality when working in an organisation, documenting the workforce. How Curtis documents the workforce. How they recreate smells; exhibition workshops. "All companies are going to have good and bad stuff happening in them. The very fact that they're embarking on this kind of work is something that they should be proud of, because it's about being transparent, and this should be the beginning of finding new ways of working." The importance of having collaborators during this type of work. What Curtis has learned about himself and how he's changed as a practitioner. How BeyondWork and Fieldwork sit alongside each other. How do we end up doing what we're doing? Looking for "those whose jobs are often invisible". The multiple reasons why workers are treated badly. Further questions you could ask after knowing whether your people are "happy". Call to action: share what you do at work and ask others too! 42:30mins Don't send people on training, when they don't want to go! Happiness at work and work life balance.